The heart of Optimizing C++ consists of several case studies of database problems that show various searching and compression algorithms, the author's source code, and careful explanation of the solutions. The author use hash coding, caching, Radix40, and binary-coded decimal (BCD) data representation in a supermarket price-lookup database. Distribution-counting sort algorithms and bitmaps that store data efficiently are both used to help build a mailing-list system. In some of the most useful sections of this book, the author looks at Huffman coding and dynamic hashing. 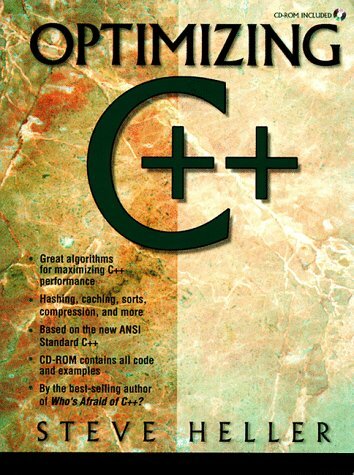 The book for knowledgeable users of C who would like to make the transition to C++. It is the main textbook for C++ programming courses at the University of Groningen. The text does not cover C++'s basic grammar, which is equal to C's grammar.